Directions : Study the following line chart carefully and answer the questions given beside. 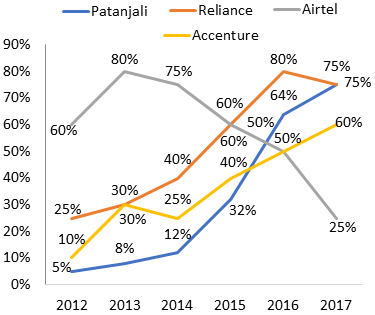 The following line graph gives the information about the percentage increase in turnover of four companies (Patanjali, Reliance, Airtel, and Accenture) during the year 2012 to 2017 with respect to previous year. At the end of 2012, the respective ratio of the turnover of Patanjali, Reliance, Airtel, and Accenture was 2 : 7 : 4 : 5 then what was the respective ratio of the turnover of all the companies at the end of 2011? Which of the following shows the approximate percentage increase in the turnover of Accenture during the six years?